WESTBROOK — Plans to renovate the Vallee Square building where she has run an art gallery and education space for four years have prompted Mary Brooking to rethink the direction of Continuum for Creativity. Brooking is looking for new space after being told her business “wouldn’t be able to stay” because of the prospective buyer’s plans to gut and refurbish the storefront. Brooking opened Continuum for Creativity at 863 Main St. in 2015. James Tranchemontagne, one of the partners in Vallee Square Holding, the entity trying to purchase the building, along with the one that houses the Frog & Turtle, wouldn’t specify the plans for Brooking’s space or the two abutting storefronts that now house Tropical Sun Tanning and Jack’s Thai. “At this time we are focused on finalizing the sale of the building and then starting our addition,” Tranchemontagne said, referring to a proposal to add a second floor at the Frog & Turtle, a gastro pub he opened in 2007. The pending sale came as Brooking was already considering the future of her business, she said. Continuum for Creativity has hosted painting classes for youth and adults, workshops, the Lowry’s Lodge Poetry series, book signings and gallery exhibits as well as paint parties and other private functions since 2015. For two years prior to opening the business, Brooking, a landscape artist, used the space for her own studio. Her new space, she said will dictate how her business will evolve. If Continuum for Creativity stays in the city, Brooking said she would like to continue hosting Paint Westbrook, a one-day plein air painting event, as she has in years past. She doesn’t have a time line of when she will be vacating. The timing, however, seems to make sense, she said because she will be out of the country for a month in February, visiting New Zealand and then Ireland. “This move seems to dovetail with that,” she said. Wherever she ends up, Brooking knows one thing: she wants to keep teaching and making art. “That is what makes me happy. That’s what I want to do,” she said. Over the last four years, Continuum for Creativity at 863 Main St., has hosted art classes, book talks, musical performances, gallery exhibition openings and other public and private events. Owner Mary Brooking is looking for a new space for her business, hopefully in Westbrook. 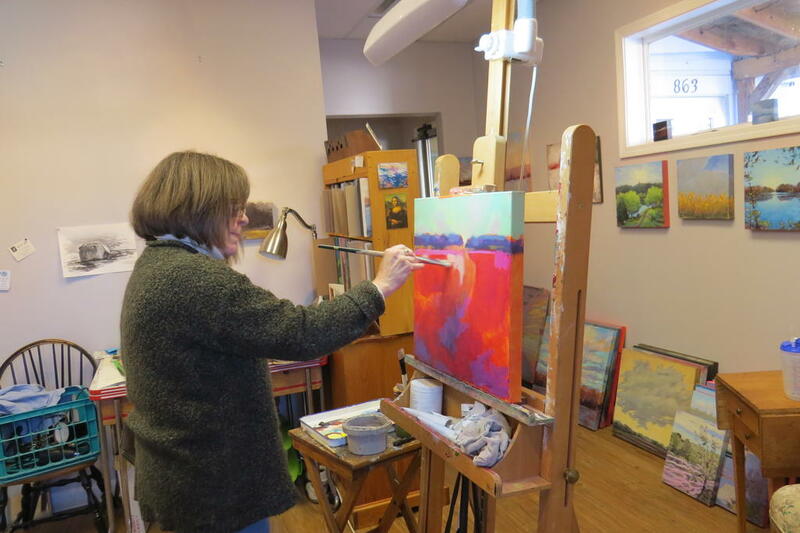 Mary Brooking paints last week in her studio at Continuum for Creativity, a space she has used for her artwork for the last six years. With the building now under contract, Brooking is looking for a new space.